This event is tailored to Middle School Youth, but is open to 5th-10th graders who will experience a day of fellowship and fun while seeds are planted both now and in the future. Life can take us many places. Along the way, how we see ourselves can change as our interests change. And yet, as time moves on; there are some things that NEVER change! So where are our youth right now? Right now, our youth may say, “I am a Christian who plays the trumpet and loves playing Xbox.” What about 2 years from now? They might say, “I am a Christian who is a Summer Counselor at Lakeshore UMA.” 5 years? “I am a Christian who is a part of a College Wesley Foundation or volunteers with Project Transformation.” 10 years? We have an army of Christians entering every imaginable career and field making Disciples and transforming the world! 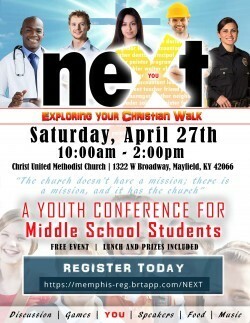 NEXT will take place at Christ UMC 1322 W. Broadway Mayfield, KY 42066. We will begin in the Church Sanctuary at 10am and end with at time of Holy Communion, prayer, and commissioning in the Sanctuary at 2pm. Lunch will be provided and this is a completely free event filled with music, games, and prizes. As part of our preparation for this day we ask participants to register (see link below) and to follow the link to the Cokesbury Youth Spiritual Gifts Assessment. This will be helpful in our journey of discovering what’s NEXT. We can’t wait to begin the journey with you! Click PDF or JPG link above to view, print, or download the flyer. Click the links below to print, view, or download the flyer.